The three California Country Dance and Song Society (CDSS) Board members — Craig Meltzner, John Seto (Sacramento), and Frannie Marr (LA/San Diego), along with NBCDS, are hosting this dine-and-dance fundraiser for CDSS! The regular third Sunday ECD has been moved to St. John’s Episcopal Social Hall in Petaluma — same time 2:00 – 4:30 p.m. — and there will be a special contra dance that evening from 6:30 – 9:30 p.m. with music by the Backstreet Boys — Rodney Miller (fiddle), Chris Knepper (mandolin), and Charlie Hancock (keyboards/accordion) and calling by Frannie Marr. 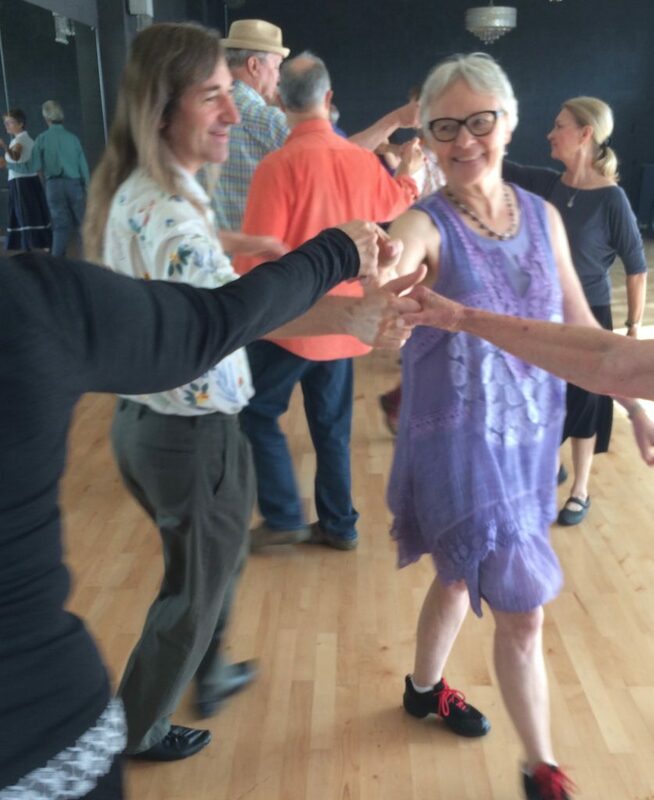 In between — 5:00 – 6:00 p.m. — there will be a catered dinner (details to follow) with a silent auction featuring, among other items, registrations to contra dance weekends such as Fiddling Frog, Echo Summit, and Faultline Frolic! Dinner tickets cost $30 (or more if you want to contribute additional funds to CDSS). All proceeds to CDSS! Separate admission to the dances (regular prices) and you don’t need to attend the dinner to come dance. For more information and to make a dinner reservation, contact Craig Meltzner at craig@nbcds.org. Support CDSS (www.cdss.org), the national organization with which NBCDS is affiliated! CDSS today is an education and arts service nonprofit, promoting participatory dance, music and song rooted in both English and North American culture, including historical and modern contra, square and English country dance, morris, sword and garland dance, English and American clogging, traditional songs, and the vibrant music which supports them. We are passionate that dance, music and song bring joy and strength to individuals and communities, and we advocate strongly for their vitality and sustainability by offering artistic, educational and organizational support to their participants.